Norwegian Morten Skogly felt that playing Rock Band 2 wasn't hard enough, not close to playing a real guitar and nowhere near physical enough. 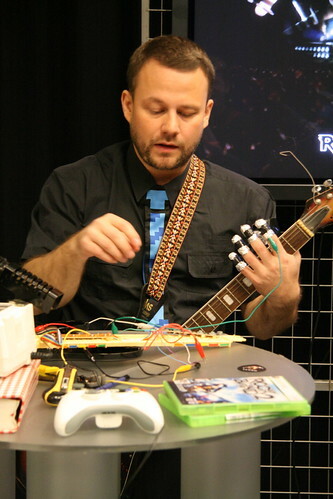 So in this intricate teardown and DIY hack at his website, you see what it takes (besides patience and technical skills) to make playing Rock Band's guitar part closer to the real experience ...with the exception of another person punching you in your arm instead of strumming yourself. Wouldn't it make more sense to hit the other arm since it wouldn't impede your frettin' hand. 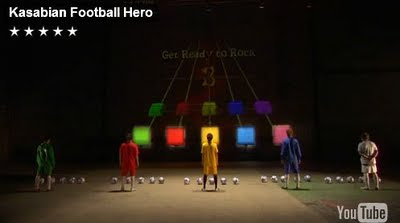 I can see how this game is kind of similar to Scott Saponas Guitar Hero Without Guitar experiment. WIBC - Although if they refine Scott's EMG sensors (to pick up EMG traces) for individuals without finger mobility and then replace the strum feature with a mouth controller - now that would be cool! Hacker - get to work! Definitely an Able Gamers project. Speaking of bikes that improve health, look at what Honda has created to teach cyclists about road hazards and proper bike safety - the Honda's Bicycle Simulator. What ever happened to the good old bike rodeos when you took your bike to a closed parking lot and have the police and fire departments, or recreation staff teach you the proper techniques. BTW - We went to one last spring and we got a free (perfectly-fitted) kids helmet, Sweet. The release date is scheduled for February 2010. One of the more interesting bits of technology is a "walking sensor" to detect when the user gets off the bike to simulate walking across an intersection. I wonder if it will be infrared or if there is a sensor in the seat...? Either way, learning how to go to the grocery store or school can now be simulated. Well when you think about where many schools and shopping areas are built (away from typical single family housing and traditional downtown) one might question whether or not the virtual world will in fact help the real world scenario. In recent years, the total number of fatalities from traffic accidents has declined in Japan. However, the ratio of fatalities in accidents involving bicycles has increased. Bicycle riders aged 10 – 19 in and above the age of 50 have the highest chance to get involved in an accident, and approximately 70 percent of bicycle accidents are caused by violation of traffic rules. Leveraging the know-how accumulated through its activities to promote traffic safety since 1964, Honda has been developing and selling motorcycle and automobile simulators since 1996 and 2001, respectively, as traffic safety educational devices which enable users to safely experience the risks based on real-world traffic situations. By offering these simulators, Honda’s goal is to improve people’s ability to predict risks and increase safety awareness. Striving to realize a richer mobility society in the future, Honda developed the Honda Bicycle Simulator as an educational tool for a wider range of people. · Equipped with monitors to check right/left and behind. 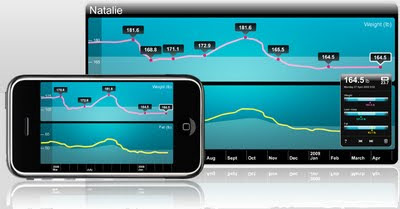 · Equipped with a “walking sensor” which recognizes the user’s action of walking the bicycle. · Contains different courses such as “going to school,” “going to the grocery store,” “going to cram school” and “going to a local shopping street” to offer realistic experiences for user groups of different ages. · Contains a course for the user to learn traffic laws and manners to ride a bicycle in mixed traffic. · After the simulation, the rider’s path can be reviewed from multiple vantage points – above/below and right/left – and the riding situation and evaluation will be displayed on the monitor. 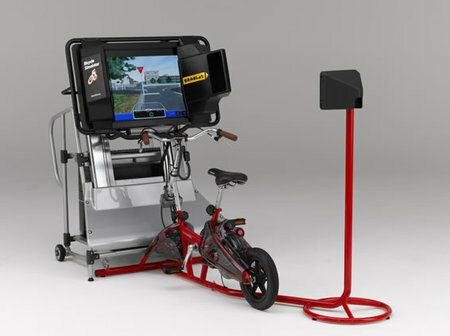 Exergame Fitness USA just announced the release of the BrainBike XG which brings together a high-end recumbent bike loaded with a pc, Gamercize's "patented response technology", and brain training software by NeuroActive. Essentially you will need to pedal to play any of the brain-training games (via arm supported mouse table) that works on 16 different brain functions (processing speed, selective attention, math skills, and visuo-spatial skills to name a few). It does not appear to be a speed-based setup such as the typical GameBikes and Exerbikes, rather it is a form of movement-mediated gaming (MMG). In other words, you have to move to play the games. The price range will likely be out of range for most homeowners but for those schools and gyms looking to combine physical and neuroplasticity activities - the BrainBike could be a solution. I'm not sure if they're looking to add games that are related to the intensity and speed of the cycler, but lots of other groups have tried.... (Pantometrics, VCycle, Espresso, Electronic Sports Dogfight, etc.. - if you have any other examples please send them to me at (exergamelab at gmail dot com). 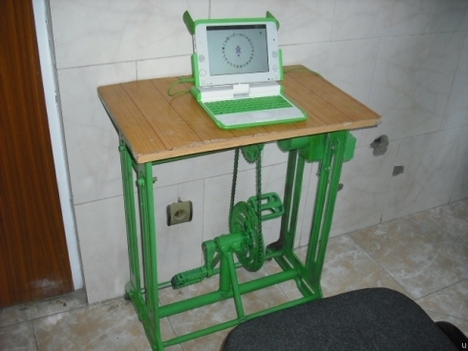 This Afghanistan OLPC invention is a practical solution to producing green-energy for the laptop and looks similar to the Stand Up Desk with Swinging Footrest pictured below. Except one will help students by allowing them to use computers and the other is a solution to being too plugged in over the years. Pick your poison. Similar to the several other flight simulator like the Electronic Sports Dogfight, the M-Cross Single Seat Simulator was trotted out at the KSF2009 Korean Serious Games Festival in Seoul, South Korea (Sept 25-27, 2009). This very maneuverable monster was equally great at playing traditional simulator games like HIS and Sonic-type action games. Now all we have to do is load up a version of one of my classic loves - 1942 and we're good to go. WIBC #? Let's strap some EMG's on some players and see what kind of muscle activation we get especially in the core abs and obliques. WIBC #? Better yet, use the readings from EMG to fly the plane....now we're talking ExerGame! Check out after the jump for more videos and photos from KSF2009. I am all for keeping things simple - KISS principle and that definitely applies to human theory and behavior around health. The WiFi Body Scale looks to be a promising device that will provide consistent information about specific health indicators that may help keep people healthier. Using a WiFi signal to pass your private information on to a secure website, this souped-up scale also packs a bioelectrical impedance device that measures a person's "body-fat percent or ratio of fat-mass to fat-free mass. Packaging an iPhone app (read ubiquitous) on top of that makes this device that much more elegant in its design and implementation. Check out after the break for more photos. 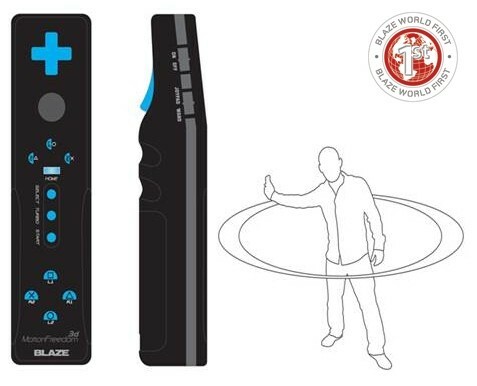 An interesting new product just popped up ahead of Xbox's Project Natal, Sony's Motion Controller, and Wii's Your Shape camera - the Blaze Motion Freedom 3D Controller for PS3. It's uncertain which technology it will incorporate, but get this,.... it was "designed from the ground up" - a tired cliche. 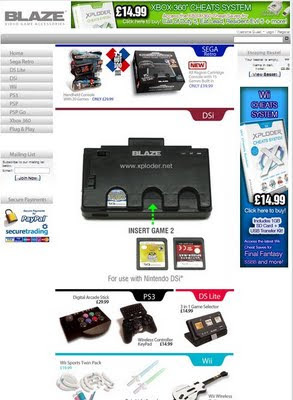 Interestingly enough, the UK-based game accessories manufacturer is not listing the device on it's main home page, the PS3 header page, but rather as a stand-alone page (See screen shots). Be sure to check back for my hands on review of another motion controller from Korea that I picked up at the KSF2009. Bigben Interactive is releasing the Cyberbike sometime in 2010 and by the looks from these photos, I'm not sure that it would withstand the pounding of kids trying to "clean up" the environment or play Mario Kart. Rather, it looks to be another hunk of plastic that will crowd our cluttered living rooms and closets and eventually hit the landfill as garbage. Pass. UPDATE: Here is a clip (Via Sporle and Co.) of what the Cyberbike will look like and a little of the gameplay. 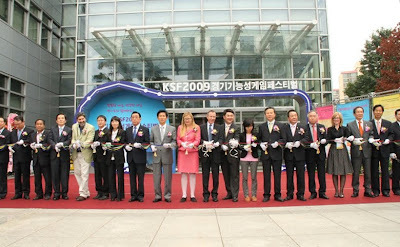 Here is my presentation from #KSF2009 - Korea Serious Games Festival in Seoul last week. View more presentations from Stephen Yang. And here are some more pictures from the tremendous opening ribbon-cutting ceremony. 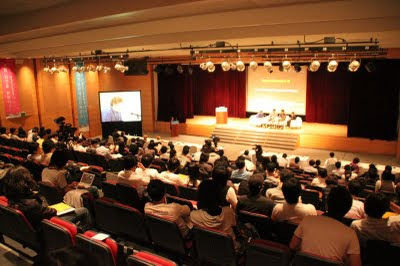 The Korean government has committed over $60 million dollars to supporting the digital arts, games, and content mostly within the province of Gyongi. They are opening a $20 million dollar facility to support these industries as well as education, software and hardware development. Now that's commitment. Play On Korea!